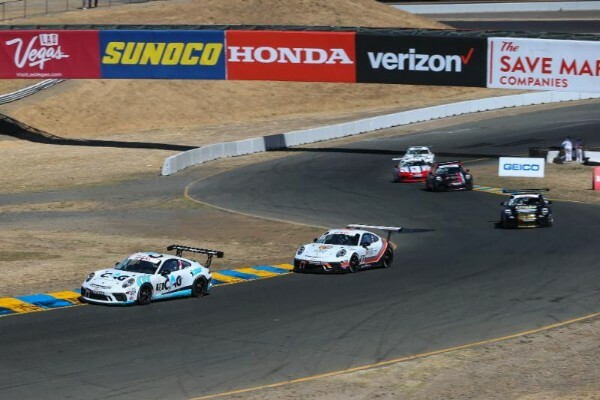 Going into Saturday’s first race of a Porsche GT3 Cup Challenge USA by Yokohama doubleheader weekend at Sonoma Raceway, Canadian driver Zacharie Robichon hadn’t run more than 10 consecutive laps around the challenging, 2.385-mile road course. As a result, he admitted to taking a conservative approach in the race, which he started from the pole position for the fifth consecutive time in the No. 19 Moorespeed Porsche 911 GT3 Cup machine. That worked out just fine for the newly crowned Ultra 94 Porsche GT3 Cup Challenge Canada by Yokohama champion, as he managed to keep the field in his mirrors through the early stages and pulled away slightly over the second half of the race to win for the fifth consecutive time. He beat Anthony Imperato in the No. 91 Wright Motorsports Porsche by 4.601 seconds to win in the lead Platinum Cup class for Porsche 911 GT3 Cup machines built in 2017 and 2018. Since joining Moorespeed as a midseason replacement for the sidelined Will Hardeman last month at Road America, Robichon has not been beaten. “Today was a tough one,” Robichon said. “Going in, we knew that tire degradation here was quite aggressive, so right from the word ‘go,’ that was the only thing on my mind. I think you guys probably saw me at the beginning dropping tires a couple times. Imperato held off a charging Trenton Estep over the closing laps to come home second in the No. 91 machine, matching his best performance of the season to date. The New Yorker also finished second in the first race of last month’s doubleheader at Road America. Estep, the Platinum Cup points leader, picked up his 11th podium result in 13 starts this season in the No. 3 JDX Racing Porsche. He now leads second place Roman De Angelis by 28 points, 408-380, with three races remaining this season. In addition, Estep turned in the race’s fastest lap, putting him on the pole position for Sunday’s Race #2 at Sonoma. Max Root came home fourth in the No. 7 Wright Motorsports Porsche, finishing one spot ahead of De Angelis in the No. 1 Kelly-Moss Road and Race machine. De Angelis prevailed in a spirited battle for fifth with David Kolkmann in the No. 71 Park Place Motorsports Porsche that went on for several laps. Alan Metni picked up his third victory of the season in the Platinum Cup Masters class for drivers 45 years of age and older. Driving the No. 99 AM Motorsports/Kelly-Moss Porsche, Metni held off Mark Kvamme in the No. 43 JDX Racing entry to take the class victory. “I’ve got to say, ‘Thank you’ to my team for giving me a great car,” Metni said. “These things are won in the training, so I’ve got to thank them for that. Today was just a fun, wonderful race. Mark was doing well the whole time, kept the pressure up the whole time. I could not get away from him. Platinum Masters points leader Charlie Luck finished third in the No. 45 Wright Motorsports Porsche and also earned Yokohama Hard Charger honors as the Platinum driver who improved the most positions from start to finish in Race #1. Luck finished ninth overall after starting 11th. Luck leads Metni by eight points, 388-380. Victor Gomez IV picked up his 10th victory in 13 races this season in the Gold Cup class for Porsche 911 GT3 Cup cars built between 2014 and 2016. Driving the No. 25 NGT Motorsport Porsche 911 GT3 Cup machine, Gomez won by a lap over teammate Sebastian Carazo in the No. 27 Porsche. He leads the Gold Cup point standings by 48 points, 432-384, over Rob Ferriol, who finished third in the No. 5 TPC Racing Porsche. “First of all, I’m thankful for having my whole family fly in from Puerto Rico,” Gomez said. “It was a really long flight and I’m just super happy to see them and cheering me on in the bleachers. NGT did a great job. The car was unbelievable all race. I was super focused. Sunday’s 45-minute Race #2 at Sonoma Raceway takes the green flag at 12:30 p.m. PT. 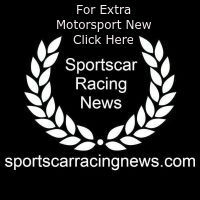 The race will be streamed live on IMSA.tv.